Template:FDRSeries Franklin Delano Roosevelt (/ˈroʊzəvəlt/, /-vɛlt/; 30 Januar 1882 – 12 Apryle 1945), eften referred tae by his ineetials FDR, wis an American statesman an political leader that served as the 32nt Preses o the Unitit States frae 1933 till his daith in 1945. A Democrat, he wan a record fower presidential elections an becam a central feegur in warld events in the first hauf o the 20t century. 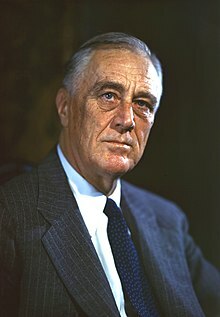 Roosevelt directit the federal govrenment in maist o the Great Depression, implementin his New Deal domestic agenda in response tae the worst economic creesis in U.S. history. As a dominant leader o his pairty, he biggit the New Deal Coaleetion, that realigned American politics intae the Fift Pairty Seestem an defined American leeberalism ootthrou the middle third o the 20t century. His third an fowert terms war dominatit bi Warld War II. He is eften ratit bi scholarts as ane o the three greatest U.S. preses, alang wi George Washington an Abraham Lincoln. Roosevelt wis born in Hyde Park, New York, tae a Dutch American faimily made weel kent bi Theodore Roosevelt, the 26t Preses o the Unitit States. FDR attendit Groton School, Harvard College, an Columbia Law School, an went on tae practice law in New York Ceety. In 1905, he mairied his fift cuisin ance remuived, Eleanor Roosevelt. Thay haes sax childer. He wan election tae the New York State Senate in 1910, an then served as Assistant Secretar o the Navy unner Preses Woodrow Wilson in World War I. Roosevelt wis James M. Cox's rinnin mate on the Democratic Pairty's 1920 naitional ticket, but Cox wis defeatit bi Warren G. Harding. In 1921, Roosevelt contractit a paralytic illness, believed at the time tae be polio, an his legs becam permanently paralysed. While attemptin tae rekier frae his condition, Roosevelt foondit the treatment centre in Warm Springs, Georgie, for fowk wi poliomyelitis. In spite o bein unable tae walk unaidit, Roosevelt returned tae public office bi winnin election as Govrenor o New York in 1928. He wis in office frae 1929 tae 1933 an served as a reform Govrenor, promotin programmes tae combat the economic creesis besettin the Unitit States at the time. In the 1932 presidential election, Roosevelt defeatit Republican Preses Herbert Hoover in a laundslide. Roosevelt teuk office while the Unitit States wis in the mid o the Great Depression, the worst economic crisis in the kintra's history. In the first 100 days o the 73rd Unitit States Congress, Roosevelt speirheidit unprecedentit federal legislation an issued a profusion o executive orders that institutit the New Deal—a variety o programmes designed tae produce relief, rekivery, an reform. He creautit numerous programmes tae provide relief tae the unemployed an fermers while seekin economic rekivery wi the National Recovery Administration an ither programmes. He an aw institutit major regulatory reforms relatit tae finance, communications, an labour, an presidit ower the end o Prohibeetion. The economy haein improved rapidly frae 1933 tae 1936, Roosevelt wan a laundslide reelection in 1936. Houiver, the economy then relapsed intae a deep recession in 1937 an 1938. Efter the 1936 election, Roosevelt socht passage o the Judiciary Reorganization Bill of 1937 (the "coort packin plan"), that wad hae expandit the size o the Supreme Coort o the Unitit States. The bipartisan Conservative Coalition that formed in 1937 prevented passage o the bill an blocked the implementation o forder New Deal programmes an reforms. Major survivin programmes an legislation implementit unner Roosevelt include the Securities and Exchange Commission, the National Labor Relations Act, the Federal Deposit Insurance Corporation, an Social Security. Roosevelt ran successfully for reelection in 1940. His veectory made him the anerly U.S. Preses tae serve for mair nor ta terms. Wi Warld War II loomin efter 1938, Roosevelt gae strang diplomatic an financial support tae China as weel as the Unitit Kinrick an the Soviet Union while the U.S. remeened offeecially neutral. Follaein the Japanese attack on Pearl Harbor on 7 December 1941, an event he famously cried "a date which will live in infamy", Roosevelt obteened a declaration o war on Japan the next day, an a few days later, on Germany an Italy. Assistit bi his tap aide Harry Hopkins an wi verra strang naitional support, he wirked closely wi Breetish Prime Meenister Winston Churchill, Soviet leader Joseph Stalin an Cheenese Generalissimo Chiang Kai-shek in leadin the Allies against the Axis Pouers. Roosevelt supervised the mobilisation o the U.S. economy tae support the war effort an implementit a Europe first strategy, makkin the defeat o Germany a priority ower that o Japan. He an aw ineetiatit the development o the warld's first atomic bomb an wirkit wi the ither Allied leaders tae lay the grundwark for the Unitit Naitions an ither post-war institutions. Roosevelt wan reelection in 1944 but wi his pheesical heal declinin in the war years, he dee'd in Apryle 1945, juist 11 weeks intae his fowert term. The Axis Pouers surrendered tae the Allies in the months follaein Roosevelt's daith, in the presidency o Roosevelt's successor, Harry S. Truman. Wikimedia Commons haes media relatit tae Franklin Delano Roosevelt. This page wis last eeditit on 7 Dizember 2018, at 20:25.